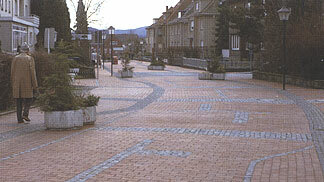 Provide appealing and comfortable pedestrian street environments in order to promote pedestrian activity. Promote public health through increased physical activity. BDCv3 PC 14 Walkable project site: 1 pt. NDv3 NPDp1 Prereq; NPDc1: up to 12 pts. BDCv4 PC 14 Walkable project site: 1 pt. NDv4 NPD Walkable streets: Prereq. ; up to 9 pts. 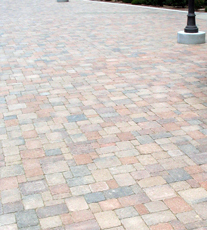 ICP and PICP naturally invoke reduced speeds, demarcating zones by texture, color, and pattern. Excellent for creating woonerfs, or home zones (an area, usually residential, where motorists and other users share the street without boundaries such as lanes and curbs). Woonerfs are included in equivalent provisions for walking. ICP and PICP excel at creating a sense of place and defining a focal-point, intimately detailed and purposed for foot traffic, inviting common areas and gathering places.